“Life Is . 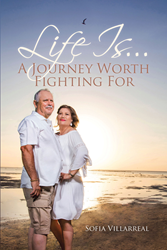 . . A Journey Worth Fighting For”: a wise, poignant book about life choices. “Life Is . . . A Journey Worth Fighting For” is the creation of published author Sofia Villarreal, a unique individual, mother, wife, and cancer survivor who learned to play the game of life well. Villarreal shares, “Opportunities are all around us. Our journey through life introduces us to many opportunities. I remember growing up and thinking the world was going to be perfect. As I went through grade school, life seemed pretty normal as I went through my everyday routines. As far as I can remember, I had a happy childhood. “Middle school seemed to be much of the same, although many seem to think that the middle school years are the toughest. It was not until my sophomore year in high school that I started to reflect on my life. I was the second child and the oldest daughter out of eight children. My mother was a first-grade teacher and very dedicated to her profession. My dad was a truck driver for a large company, and later in life, he worked for the county as a foreman in one of the precincts. Published by Christian Faith Publishing, Sofia Villarreal’s new book is a rejuvenating book that seeks to elevate the reader to a point of faith where they can create a better life, no matter their circumstances. Villarreal shows through her personal story how every day is a chance for learning and growing. View a synopsis of “Life Is . . . A Journey Worth Fighting For” on YouTube. Consumers can purchase “Life Is . . . A Journey Worth Fighting For” at traditional brick & mortar bookstores, or online at Amazon.com, Apple iTunes store, or Barnes and Noble. For additional information or inquiries about “Life Is . . . A Journey Worth Fighting For”, contact the Christian Faith Publishing media department at 866-554-0919.